Young at Art is an annual art festival at the Nirmal Bhartia School (NiBS) in New Delhi. I have worked closely with NiBS since 2016, and when invited to do a workshop with middle and high school students, was most excited. During Young at Art the school overflows with the artistic creations of its 300 plus students. The campus explodes with painting, pottery, paper art, music performances, demonstrations and presentations by artists, musicians and writers. 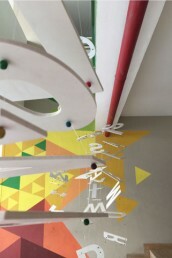 The idea of an installation popped up, something that could be co-created with the student participants. Typographic form has been an obsession since my design school days and I have a somewhat evangelist zeal about it. 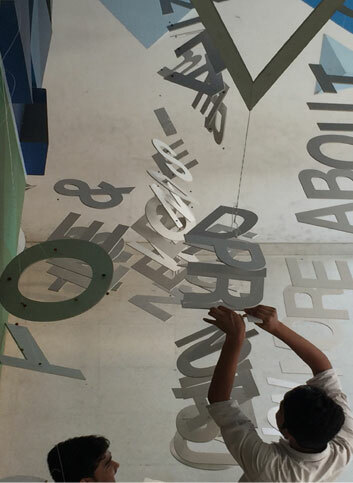 Now that I had an opportunity to ‘spread the word’ –literally and figuratively –I thought of putting up a typographic installation along with the students. 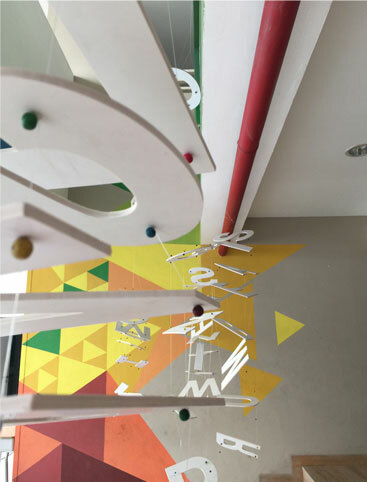 For the students to have a personal connection with their creation, the idea of creating the typographic installation from their own writings came up. 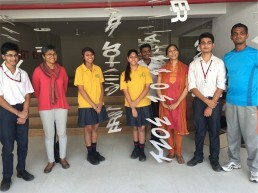 To make the entire process tangible, Pooja Jhaver, who runs the school suggested that they write about any recent school trip which had made a deep impression on them. From the students’ writing, the most meaningful phrases and expressive words were shortlisted. These were machine-cut into large Helvetica font letterforms, around 15” in height. Held together with beads and fishing wire, these formed the building blocks of the installation. 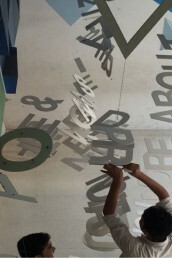 Student participants, teacher volunteers and school staff collaborated to string the of letters together. 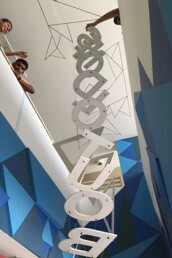 These long lines of letters were then suspended aesthetically in a large common area in the school. 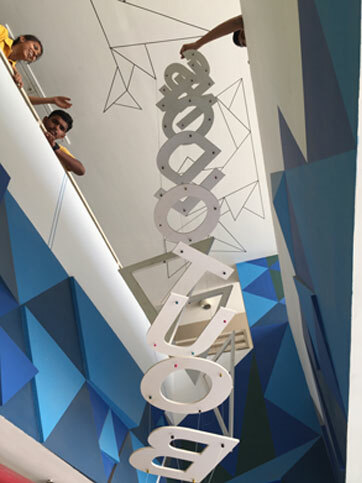 Though we worked on the installation for only 2 intense days, the students appreciated the value of co-creation and were able to understand that artistic expression arises from self-reflection.